Gaiam's Tree of Life Yoga Tote fits any mat up to 24" wide and leaves room for more of your yoga essentials, like a towel or headband. Features a magnetic snap closure, exterior and interior zip pocket, and our signature Tree of Life design embroidered onto the bag’s canvas. The large interior pocket is fully lined with naturally wicking nylon, so you can toss your wet towel or gym clothes in without worry. Measurements: 30"L x 6"D x 11"H with 33" long shoulder straps. 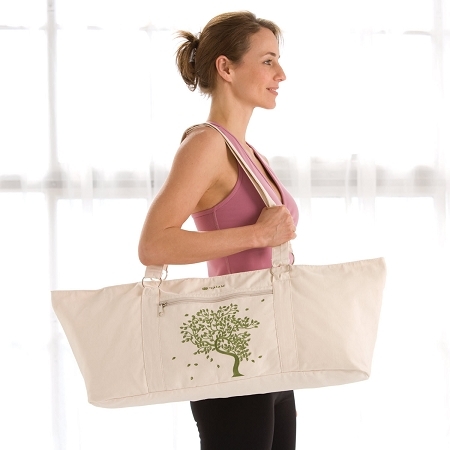 Love this new Yoga tote idea, not only for Yoga practice but also for multi purpose use.